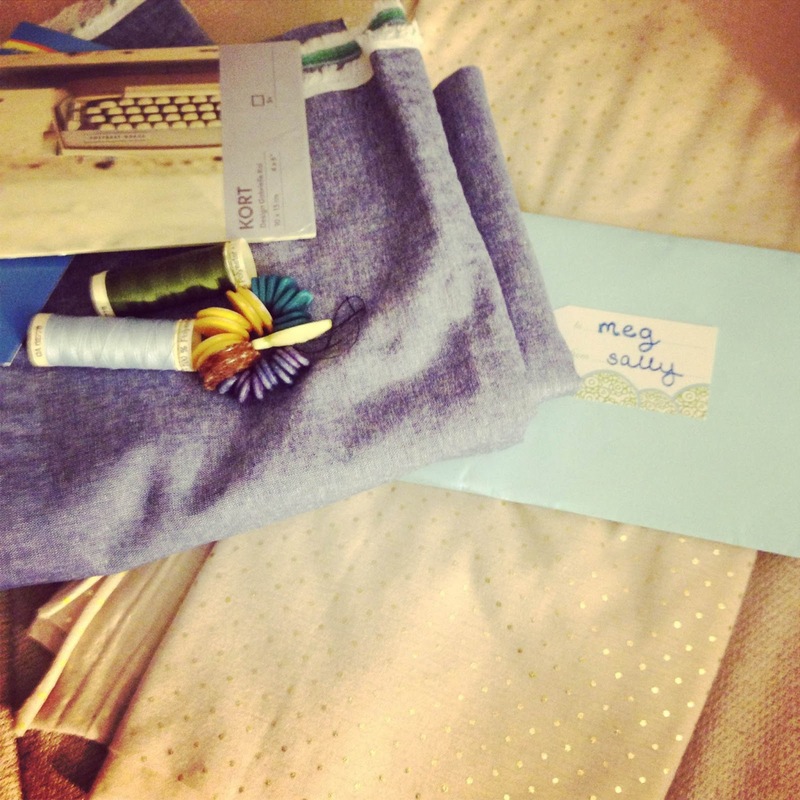 Made By Meg: Sewing Swap Reveal! This year I have had the pleasure of participating in the Spring Sewing Swap sponsored by Kestrel Makes. I was paired up with the lovely Sally of The Quirky Peach, whose sewing I have already admired. Well, the package came last week and I believe I audibly gasped when I opened it - so pretty! We had already discussed our love of the Scout Tee, and so that soft chambray is destined to become my very first one, perhaps with some two-tone coloring or piping and a pocket. The polka dot is a jersey with metallic gold, which I'm already thinking would make a very cute birthday peplum top for the end of this month. On top of that, I have some thread and buttons to work with, and my boyfriend has been eyeing the set of vintage postcards that came in. Sally, you really do think of everything! The sewing swap was also fun in terms of shopping for someone else. I found that I was much more conscious of the fabrics I chose, and wanted to really get something that would be high quality! You can check out what I sent Sally over at her blog. Now, to finish the final touches on setting up my apartment and get sewing. Rebecca - I have been naughty and not set up my sewing machine yet like I promised :( There were bills to pay! I love the gold polka dot fabric, quite subtle but sophisticated. And chambray is always a winner too. I'm curious to see what you'll make! Also, I'd like to send you an email but can't find your address... Mine is l.kievits at gmail dot com. This is SUCH a cute idea!!! Like long distance hand holding! I can't wait to see what you both come up with!